Assigned status Up to Date by Derek W DelMonte, MD on June 17, 2018. There are several types of cataract including age related, traumatic, and metabolic. Age related is the most common type and the pathogenesis is multifactorial and not fully understood. 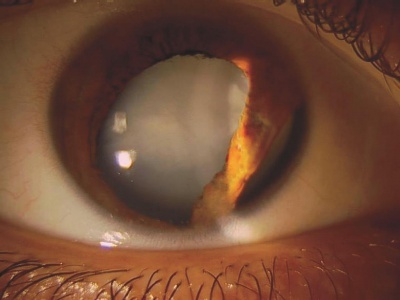 A traumatic cataract can occur following both blunt and penetrating eye injuries as well as after electrocution, chemical burns, and exposure to radiation. 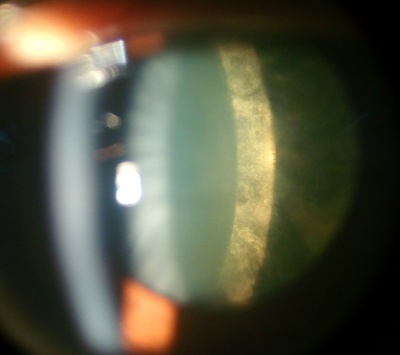 Metabolic cataracts occur in uncontrolled diabetics, patients with galactosemia, Wilson disease, and Myotonic dystrophy. While the majority of cataracts in the population are age-related, or senile, cataracts, there are many types and causes of cataract. 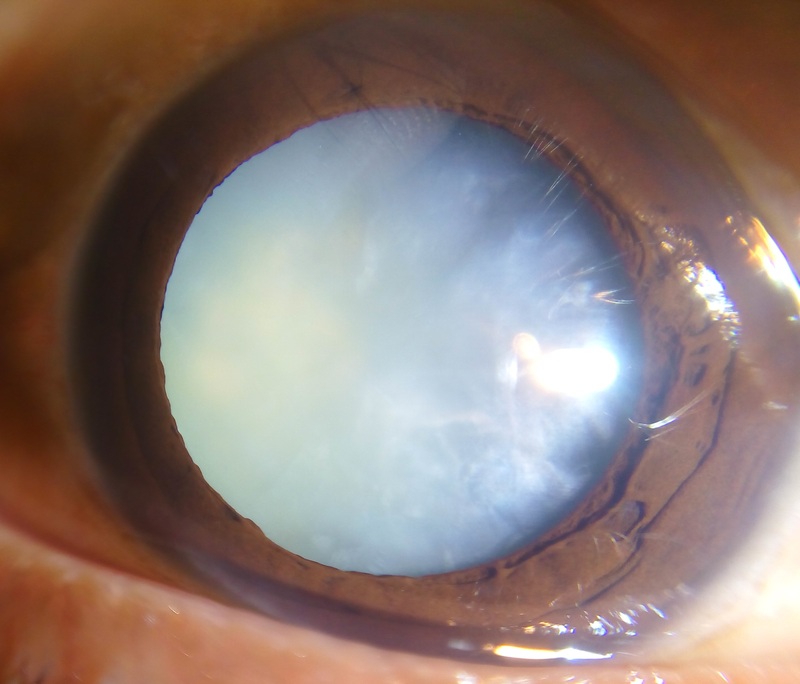 This article will discuss the three most common types of cataracts (nuclear, cortical, and posterior subcapsular) as well as other less common types including anterior subcapsular, posterior polar, traumatic, congenital and polychromatic. Age related is by far the most common type of cataract and it is divided into 3 types based on the anatomy of the human lens. There are Nuclear Sclerotic, Cortical and Posterior Subcapsular Cataracts. Patients commonly develop opacity in more than one area of their lens which can cause overlap in the classification of cataracts. Note anterior white cortical deposits and central greenish brown nuclear color changes. 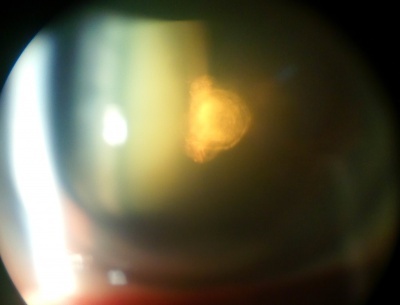 Nuclear sclerotic cataract of a 70 years old male (Diffuse illumination). 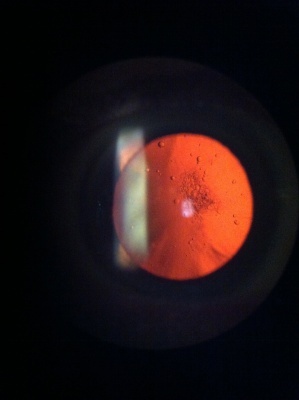 Brunescent nucleus after cataract extraction. Nuclear sclerosis is the yellowing and hardening of the central portion of the crystalline lens and it occurs slowly over years. As the core of the lens hardens, it often causes the lens to increase the refractive power and causes nearsightedness. This is why some patients who had previously relied on reading glasses for reading may no longer need them once a nuclear sclerotic cataract starts to form. This type of cataract can also cause colors to be less vibrant although the change is so gradual that it is often not noticed. Retroillumination of cortical cataract. Note spoke-like opacity from center to periphery. Cortical and nuclear sclerotic cataract. Note opacification of central oval shaped nucleus and surrounding cortex are visible separately by oblique slit beam. Cortical cataracts occur when the portion of lens fibers surrounding the nucleus become opacified. The impact on vision is related to how close the opacities are to the center of the visual axis and their impact can vary greatly. Progression is variable with some progressing over years and others in months. The most common symptom from cortical cataracts is glare, especially from headlights while night driving. 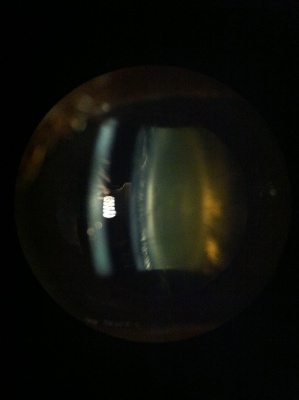 Retroillumination of crystalline lens showing patchy opacification of posterior subcapsular part. Posterior subcapsular cataracts (PSC) are opacities located in the most posterior cortical layer, directly under the lens capsule. 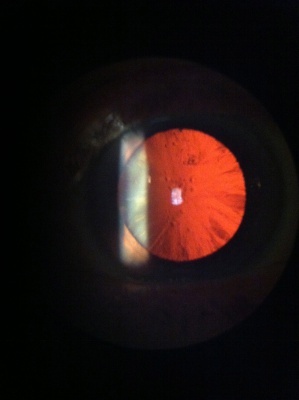 This type of cataract tends to occur in younger patients than cortical or nuclear sclerotic cataracts. Progression is variable but tends to occur more rapidly than in nuclear sclerosis. Symptoms are glare, difficulty seeing in bright light, and near vision is often more affected than distance. 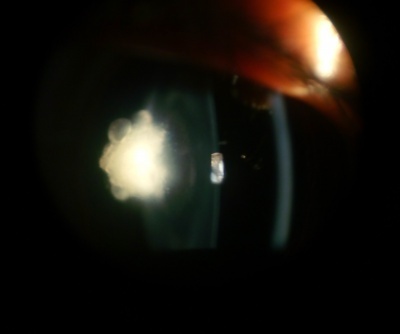 Anterior subcapsular cataracts can develop idiopathically, may be secondary to trauma, or may be iatrogenic. 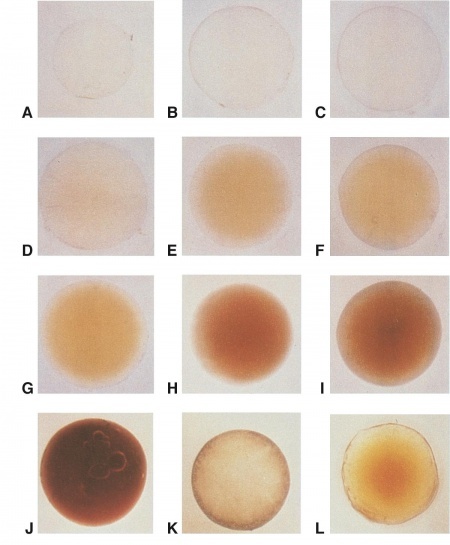 Phakic intraocular lenses used to correct refractive error, such as the Visian implantable collamer lens (ICL), have been reported to cause anterior subcapsular cataracts due to ICL-lens touch from inadequate vaulting of the ICL. Snowflakes appears as gray-white subcapsular opacities. 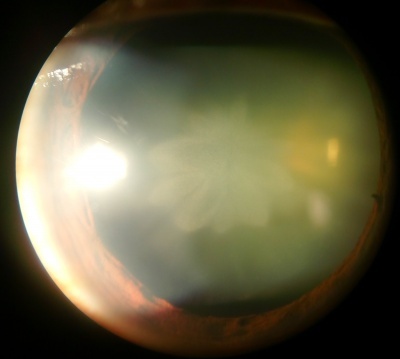 Often, these cataracts progress rapidly and the entire lens becomes intumescent and white. 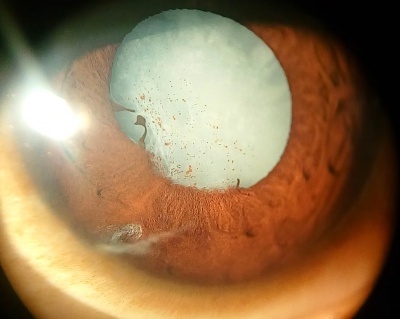 Cataracts often occur at younger ages in diabetic patients due to osmotic stress from intracellular accumulation of sorbitol in the lens secondary to elevated intraocular glucose. A rapid onset form of cataract, which is quite uncommon, may be found in some diabetic patients with very elevated blood sugars, especially younger type 1 diabetics. 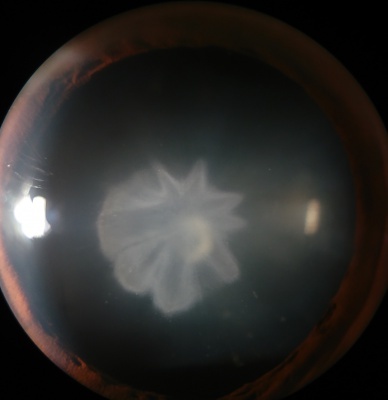 Posterior polar cataracts are characterized by well-demarcated white opacities in the center of the posterior capsule. These opacities often project forward as cylinders penetrating into the posterior lens cortex. 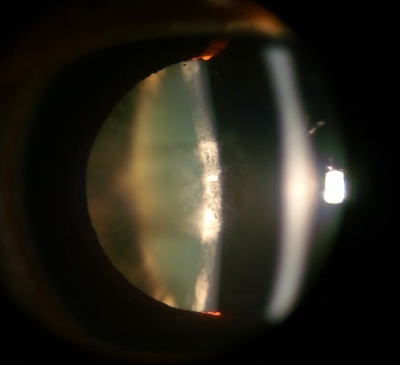 Posterior polar cataracts are typically congenital and autosomal dominantly inherited. 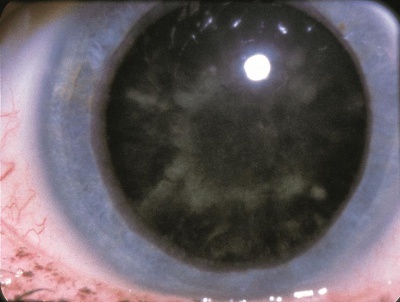 Most posterior polar cataracts are asymptomatic or minimally symptomatic. However, over time posterior subcapsular (PSC) opacities may form around the posterior polar opacity. As the PSC progresses, vision may be severely affected. 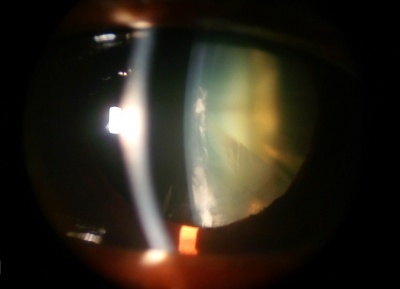 Posterior polar cataracts pose a unique challenge for cataract surgery. The rate of posterior capsular rupture is significantly higher in these cases. The posterior capsule is weakened around the posterior polar opacity and in some cases there may even be a defect in the capsule. 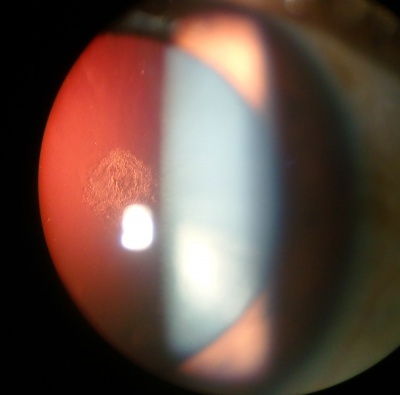 A traumatic cataract develops to the effected eye after an incident. Cataract, posterior synechiae, iris injury and corneal opacity due to penetrating ocular injury. Stellate cataract due to blunt trauma. 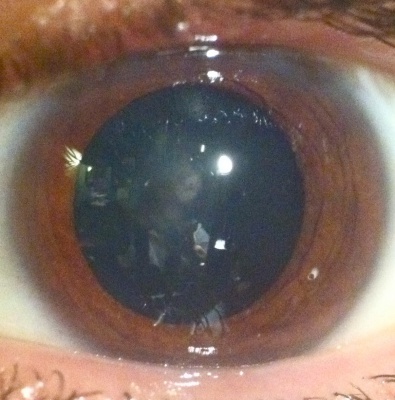 The clouding of the lens at the site of injury which could extends to the whole lens. The development could be quick after the incident. 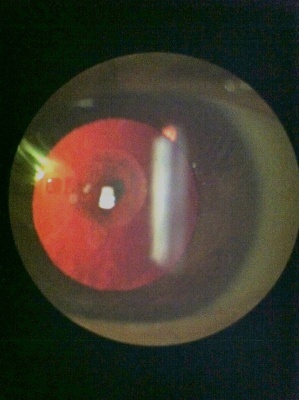 Congenital cataracts may occur as unilateral or bilateral isolated findings or may be associated with systemic disease. Most cases associated with systemic diseases are bilateral. 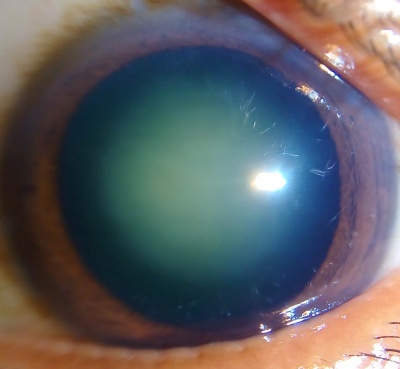 Approximately 1 in every 250 children in the United States is born with a congenital cataract (defined as some lens opacity present at birth), but many are subclinical. 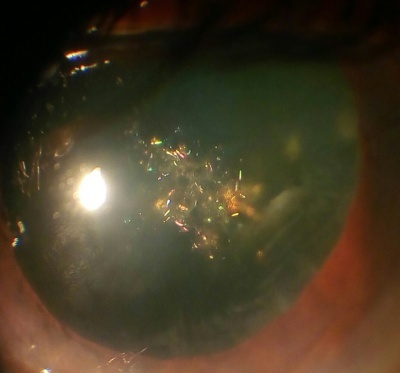 Also known as a "Christmas Tree" cataract, these consist of highly reflective, iridescent corneal crystals of various colors. They may be seen as a rare variant of senile cataractous development and they are also found with a higher prevalence in patients with myotonic dystrophy. would the patient tolerate the operation and be able to follow postoperative instructions and follow up care. If the answers to these questions lead the patient and physcian to agree that surgical intervention is warranted, preoperative planning must be done. Visual function is determined by asking the patient how they are limited in function by their vision and by measuring their visual acuity with and without spectacle correction. In patients complaining of glare, brightness acuity is tested by asking a patient to read the eye chart while shining a bright light at the patient from the side. There are also other instruments which can mimic glare. These simulate the oncoming headlights of night driving and can reveal functional impairment. A comprehensive dilated eye exam is performed on all patients when possible. Specific attention is paid to several factors impacting surgical planning including the severity of the cataract, the size of the dilated pupil (smaller pupils increase the complication rate), the clarity, thickness and health of the cornea, stability of the lens, depth of the anterior chamber, and health of the optic nerve and retina. In order to get the best possible visual outcomes, several preoperative measurements are necessary to determine the power of the IOL implant. 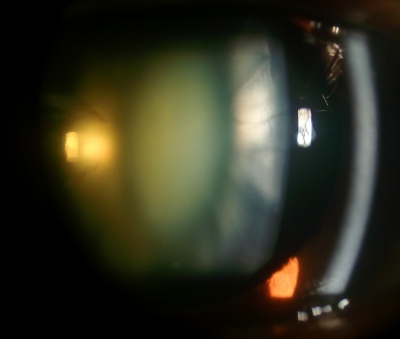 A careful refraction of both eyes, especially if planning on operating on only one eye, is needed to avoid dissimilar refractive errors postoperatively, as this can be disturbing to patients. To determine the IOL power needed, measurements of the axial length of the eye, the corneal refractive power, and the anterior chamber depth are taken. Additional tests that can be helpful in select cases include corneal topography and endothelial cell counts. No medical treatment has been show to be effective in the treatment or prevention of cataracts, although this is an active area of research. To slow the development of cataracts it is generally recommended that patients eat a balanced diet, prevent excessive exposure to UV radiation by using good quality UV blocking sunglasses, avoiding injuries by using protective eyewear, and if diabetic closely control blood sugar levels. Other approaches to temporarily improve visual function include careful refraction to get the best-corrected vision, pharmacological dilation, increased lighting and the use of magnifiers for near work. Cataract surgery is one of the most common surgical procedures performed around the world and has a very high success rate. The most common type of cataract surgery in the United States utilizes ultrasound energy to break the cataract into particles small enough to aspirate through a handpiece. This technique is referred to as phacoemulsification. 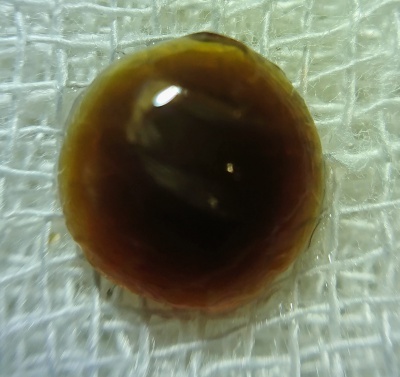 Other techniques include manual extracapsular cataract extraction (ECCE) in which the entire nucleus of the cataract is removed from the eye in one piece after extracting it from the capsular bag. While ECCE traditionally involved a large incision that required multiple sutures, a newer techinique known by many names (such as manual small incision cataract surgery or small incision ECCE) allows for manual extraction without the need for any sutures. 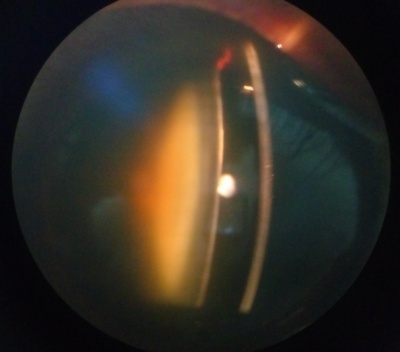 The goal in modern cataract surgery is not only the removal of the cataract, but also the replacement of the cataract with an intraocular lens (IOL). 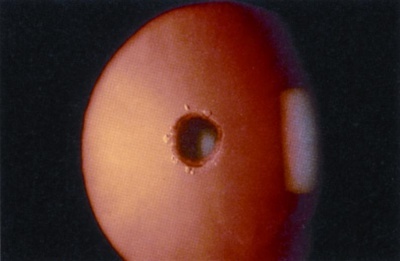 The IOL is typically placed during the cataract surgery, and may be placed in the capsular bag as a posterior chamber lens (PCIOL), in the ciliary sulcus, as a sulcus lens, or in the anterior chamber anterior to the iris as an anterior chamber lens (ACIOL). There are multiple types of IOLs that may be used in modern cataract surgery, including monofocal, multifocal, accomodative, and astigmatism-correcting lenses. The goal of all IOLs is to improve vision and limit dependency upon spectacles or contact lenses. 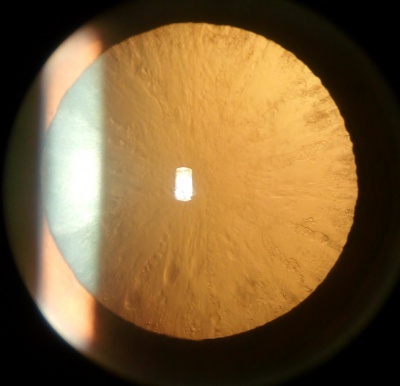 Recently, the femtosecond laser, familiar to the refractive ophthalmologist for its role in LASIK, INTACS, and corneal transplantation, has been adapted to assist in cataract surgery. This procedure still relies upon the cataract surgeon to remove lens material in a manner similar to phacoemulsification, but it replaces several manual steps of the procedure with a more automated laser mechanism. 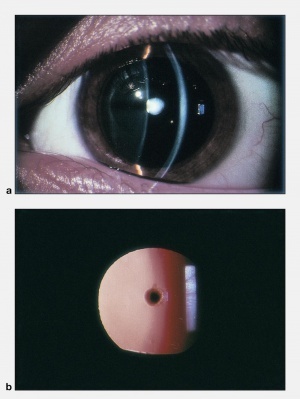 Boyd K, Pagan-Duran B. Cataracts. American Academy of Ophthalmology. EyeSmart® Eye health. https://www.aao.org/eye-health/diseases/cataracts-list. Accessed March 07, 2019. American Academy of Ophthalmology. Core Ophthalmic Knowledge: Adult cataract Practicing Ophthalmologists Learning System, 2017 - 2019 San Francisco: American Academy of Ophthalmology, 2017. American Academy of Ophthalmology. Pediatric Ophthalmology/Strabismus: Congenital and acquired cataracts in children Practicing Ophthalmologists Learning System, 2017 - 2019 San Francisco: American Academy of Ophthalmology, 2017. ↑ Basic Clinical Science Course (BCSC) of the American Academy of Ophthalmology. Section 11. 2006 - 2007. This page was last modified on April 7, 2019, at 05:18. This page has been accessed 330,096 times.